Figure 26: High-pass HPF filters family for ASA-1-FC extension. Filters are attached to the output of the ASA-1-FC extension. Digits in the filter label indicate multiplication factors of the filter. 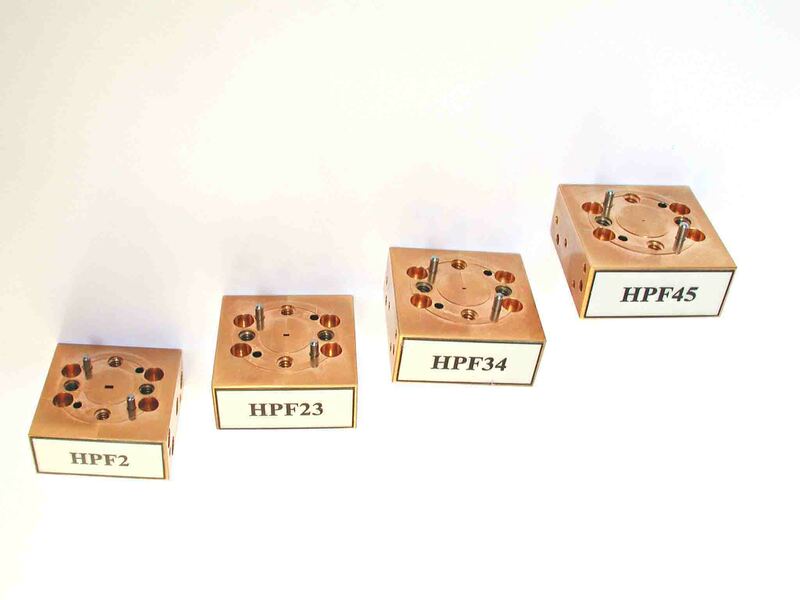 For example,HPF2 is designed for the frequency doubling with the tunable multiplier TMU in the range 140-170 GHz. The output waveguide is WR-6.5. The HPF23 can be used with multiplication factors 2 and 3, and it uses WR-4.3 waveguide for the frequency range 170-260 GHz. Two other filters, HPF34 with the waveguide WR-2.8 and HPF45 with the waveguide WR-1.9 cover frequency ranges 260-400 GHz and 400-600 GHz correspondingly.